Are you an eBay seller? Did you know that supporting charities like the Center for World Music can benefit your online sales? Were you aware that, according to the 2010 Cone Cause Evolution Study, “83% of Americans wish more of the products, services, and retailers they use would support charities”? Supporting non-profits and charities can not only do a world of good for the recipients of your donations, but it can also benefit your online business. The fact is that implementing a donation program into your business model contributes to revenue increase, customer attraction, and community build-up. Not to mention the tax deduction bonus . . . The Center for World Music is a registered eBay charity. Do you believe in our work of preserving traditional arts, bringing music and dance to the schools, and supporting traditional performing artists? A partnership with eBay for Charity and the Center for World Music might well help your business—as well as this worthy cause. Please read 5 Ways Supporting Charities Can Benefit Your Ecommerce Business and consider partnering with the Center for World Music on eBay for Charity. 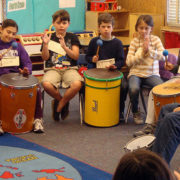 What Do Children Think About Learning World Music?